PARIS, May 23, 2011 (AFP) - France's junior transport secretary Thierry Mariani warned on Monday that flights would be cancelled if an ash cloud from Iceland's Grimsvoetn volcano blew over Europe, sending airline shares tumbling. "One thing that is certain ... is that if Europe is affected then flights will be cancelled," Mariani said on Europe 1 radio, adding that it was too early to say for certain if it would. 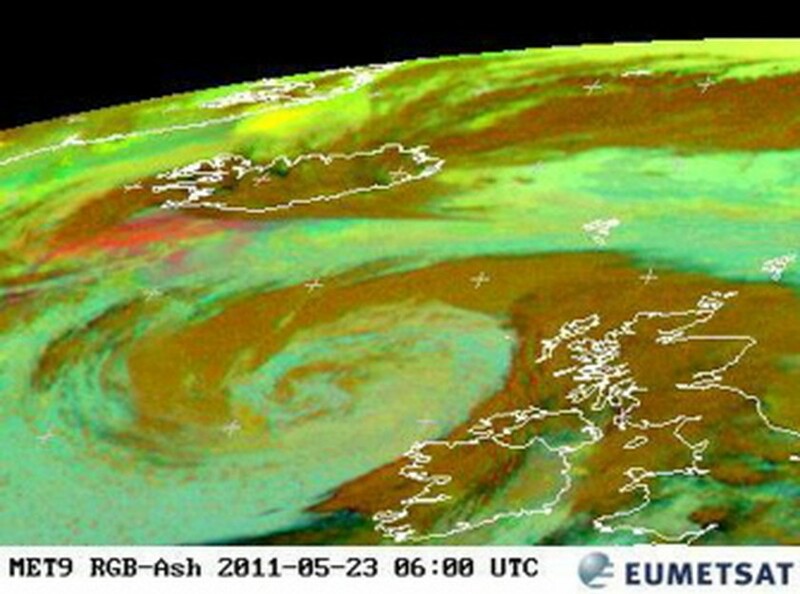 AFP - An image released by Eumetsat on May 23, 2011 shows concentration of ash over Iceland. Shares in Air France-KLM plunged four percent at the opening of trading. In Germany, the price of shares in Lufthansa airline fell by 4.56 percent. "If the ash isn't noxious then the planes will fly. If the ash is noxious or presents a risk, then the planes won't fly," he added. In April 2010 Iceland's Eyjafjoell volcano erupted, spewing a massive cloud of ash that caused the planet's biggest airspace shutdown since World War II with more than 100,000 flights cancelled and eight million passengers stranded. Concerns that the ash could damage aircraft engines led authorties to cancel flights as a precaution. "The priority should always remain safety, without of course abusing the principle of precaution," said Mariani.